Koi pond design is much more involved than what many people think. However, owning a pond can be a highly rewarding experience, Splendor Koi and Pond offers full design construction and consultation services. We will do everything in our power to make designing your perfect pond as easy as possible, even if you choose to build the pond yourself. 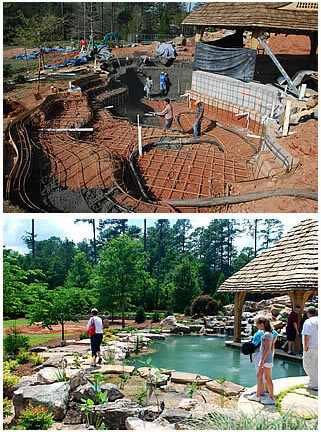 A pond project demands careful planning in order to ensure a perfect end product. Why do I Want a Pond? Everyone wants something different out of their ponds. Some crave the sound of running water, while others want to add to the natural beauty of their home, using the water feature to attract birds and other wildlife. Still others buy a pond solely for the care of the fish: either they want to keep fish for the first time or they want to provide a better home for their aquarium-kept goldfish. There are many wonderful reasons to own a pond or water feature, and deciding what you want out the project will help you decide what sort of design you want. Do I want a koi pond or a water garden? While the differences between the two may seem slight, this decision has a profound effect on the construction and continued maintenance of your pond project. A koi pond is, as the name suggests, designed to provide the ideal environment for koi and other fish. Koi ponds should be at least at least four feet deep, and generally have steep sides and several hiding places for fish. A Koi pond will also require a more complex filtration system, in order to process the amount of waste that fish produce. A water garden is designed to hold plants, but not fish. Water gardens are much easier to take care of and maintain, but are much more limited in what they can house. A water garden is typically more shallow than a koi pond, and is designed to house water and bog plants such as irises, lilies, reeds, bulrushes and much more. While a water garden does not require a full filtration system, an aerator and regular water changes are still recommended. Who will be building my pond? A pond is not just a hole in the ground with some water in it: it requires carefully installed equipment, liner, a carefully planned design and a knowledgeable designer in order to make sure the project is done right. Many new pond builders choose to build their pond themselves, or hire inexperienced workers, to do the job for them in the interest of saving money. Unfortunately, this usually results in an expensive disaster. Here at Splendor Koi and Pond, we strive to help pond owners every step of the way. If you are in the middle of a new pond project and need advice, we will be happy to help you every step of the way. Or, if you decide that DIY isn’t your best option, we can do the job for you: our years of experience means the job will be done right, guaranteed. Who will be maintaining my pond? A pond isn’t something you build and then forget about. 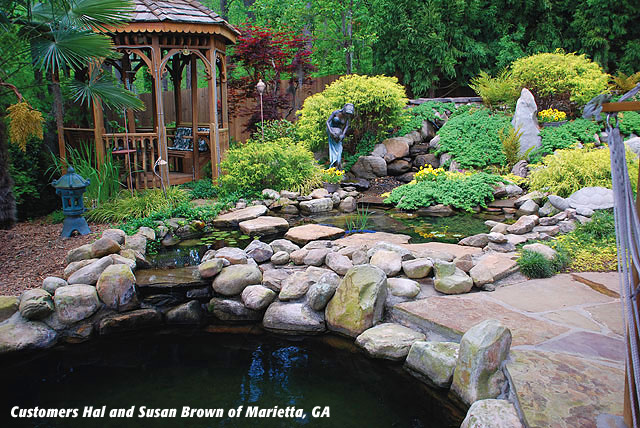 Like any landscaping project, a pond will require regular maintenance in order to keep it healthy and beautiful. This includes a weekly water change, cleaning the filtration system as needed, feeding the fish, and keeping plants trimmed. If you are unwilling to do this, Splendor Koi and Pond offers full-service maintenance plans, which can be customized to fit your schedule. A well-designed koi pond or water garden is defined by a unity between engineering and aesthetics. Engineering refers to the equipment and mechanical design of the pond: what filters are used and where they are placed, the strength of the pumps, the thickness of the liner, the plumbing, drainage, UV systems and more. This makes up the backbone of a pond environment: if any of these things is missing or installed improperly, the habitat will degrade over time and become nearly impossible to maintain. However, most visitors don’t consider that aspect of pond design. The joy of pond keeping comes from creating and maintaining a personal oasis, somewhere to escape from the rest of the world. This beauty is achieved with healthy, active fish, clear water, creative stonework and thoughtful design. A pond designed without these considerations will not be pleasing to visitors or the pond owner. A good pond becomes a spectacular one when sound mechanical design meets tasteful aesthetics. Splendor Koi and Pond is proud to say that we’ve mastered this formula. To let us begin creating your very own place of Splendor, call 770-321-FISH today.